Originally I am from the fine state of Michigan, but I have lived in Nevada, Missouri, since 1988. Since that time, I have been the coordinator of campus activities, tickets, and calendar at Cottey College, a private women's college offering associate degrees and select baccalaureate programs. In addition to planning, promoting, and producing a wide variety of performing artists, I am also the curator of the P.E.O. Foundation Art Gallery at the college. I have taken a few art classes just for fun at the Spiva Center, at the Nevada Regional Technical Center, and at Cottey College. My bachelor's degree is in conservation and my master's degree is in campus recreation (so when combined, I am certified to play outside!) This is the first piece I have entered in a professional gallery. While I was not directly affected by the tornado, I know several people who lost their homes, businesses, and family members. I am the American Red Cross Vernon County disaster chair and volunteered with the local Red Cross in setting up shelters in three locations in and around Joplin soon after the tornado hit. The physical devastation was (and is) profoundly amazing. I was so glad that Spiva was offering an opportunity to provide self-expression of thoughts and feelings related to the tornado. I knew that many pieces would reflect the destructive physical impact of the tornado on the people of Joplin, and I wanted to convey the feelings of loving, kindness, and hopefulness of the survivors and volunteers that emerged afterwards. I attended the opening of the exhibition and felt extremely uncomfortable wearing the name tag indicating I was an "Artist," as I do not think of myself in that way. I work with professional performing and visual artists on a daily basis and cannot compare myself to people at that level. My piece is entitled "Remembering...Protecting...Caring..." and represents some of the emotional stages that survivors and volunteers went through. 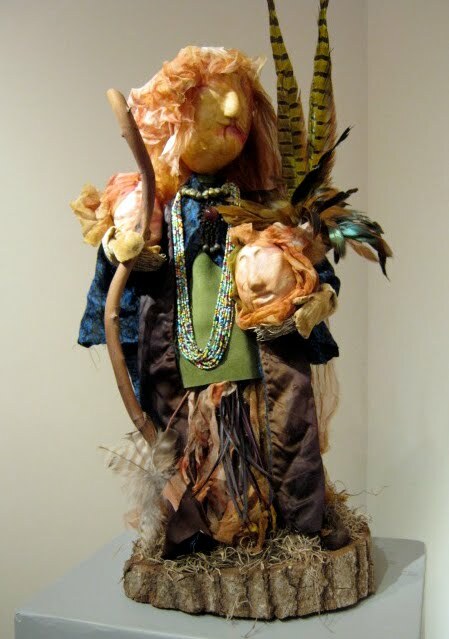 The figure is based upon a Native-American grandmother who is looking both backwards and forwards. She is acknowledging the loss and is trying to accept the present while preparing for the future. She is holding two heads, each nestled in a bird's nest, in a protective manner. Have these two physically flown from this devastated area, or is she trying to care and comfort them? It's up to the viewer to decide. The head of the piece is made of paper clay covered in hand-dyed silk and the body is built on a wire armature. The hair on all three heads is made of silk and the outerwear is remnants of an old dress. The skirt is made of small sticks and the feet are made of nut shells and fur. While none of these materials are from the Joplin area, one could easily have found them on the ground and in the trees. The figure stands on a base that has a large heart shape naturally formed in the center of the wood. I am for an art revolution.